Several people have asked me how I made the whiteboard movies about my work (see here and here). So here is a brief explanation. 1. First, I make drawings on paper and write a text that will go with the drawings. 2. Next I make the drawings on a small whiteboard and record it with my iPhone. 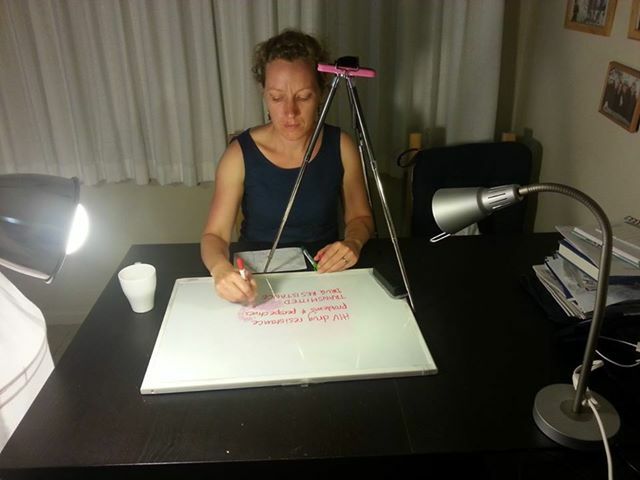 Here is a picture of my set-up for making the whiteboard movie. The pink thing is my iPhone 4, which takes the movie. I need several light sources to reduce the shadow from my hand (but they shouldn’t leave a reflection on the whiteboard). The iPhone is mounted on a tripod with a special iPhone part. Maybe a different camera would be even more convenient, because with the iPhone I cannot zoom, and thus the height of the camera isn’t flexible. My set-up for making a movie on the kitchen table. 3. After I shoot the movie I import it to iMovie, where I can cut it, speed it up and add a voice-over. I use a simple plug-in microphone for the voice-over. 4. When everything is done, I ask someone else to look at it and I realize that the story has to be told in a slightly different way, so I start again at step 1! Making a whiteboard movie is a lot of work, but it is lots of fun too.